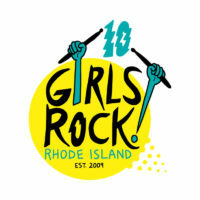 Keep your eyes peeled for volunteer opportunities at our next Girls Rock Camp! Volunteering for camp is fun and rewarding, and there are flexible positions available for those with or without musical experience, for folks of all genders! Volunteers must be at least 18 years of age or older. New volunteers are required to do an interview with our volunteer coordinator. Please read the volunteer descriptions and fill out the volunteer application below to get involved and join the fun! (Female, trans, gender non-conforming only; experience required) We are looking for individuals to instruct vocals, guitar, bass, drums, and keyboards daily. A basic or advanced knowledge in the instrument you are teaching is required, and while not necessary, experience in a band setting is always a plus! You will be working with participants who have varying levels of experience in music. Some have taken lessons before but others have never even touched an instrument in their lives. This position is a great chance to pass on your super sweet skills! Don’t worry; there will be an opportunity to meet with your fellow instructors at least once before camp to decide on a curriculum or teaching method. Lessons are frequently team taught as well. (Female, trans, gender non-conforming only; experience required) On the first day of camp, campers form their own bands with whom they write an original song together throughout camp. Band coaches are seasoned musicians who are available at Ladies Rock Camp as a resource to camper bands during daily practice time, and at Girls Rock Camp are assigned to 1-2 bands to work with all week. Band coaches help campers with all aspects of working in a band: setting up, tuning, songwriting, learning to play as a group, learning to listen to one another, communicating effectively, supporting each other, and stage presence – while not taking creative control. The goal is for the campers to write and create their own music, the coach’s job is to help if needed! The coach will also help campers break down instruments after each practice and at the show. Coaches should also be prepared to mediate the occasional musical dispute. Knowledge of more than one instrument, and the songwriting process, is helpful! (any gender; experience preferred) Roadies move and set up equipment (guitar amps, keyboards, bass amps, guitars, basses, drums, PAs) when and where necessary at camp each day; tuning and gear knowledge is a plus. Roadies are especially needed for the end-of-camp showcase, during which they will move, set up, and tune equipment. This job is not to be underrated and helps camp run smoothly and efficiently! (any gender; experience required) Technicians will be in charge of repairing and tuning equipment whenever needed before camp, during camp, and at the showcase. This will involve changing strings, drum heads, tuning, and setting up guitar amps, guitars, bass amps, basses, drums, and sometimes PAs. A general knowledge of more than one instrument is encouraged but not necessary. It would be helpful if this could be combined with roadie duties, but not necessary. (Female, trans, gender non-conforming only; experience required) Instructors will teach various hour-long interactive workshops in an assembly setting based on their interest and experience. These will include but are not limited to social issues workshops related to gender roles, girls and women in the media, girls and women in rock history, relational aggression (girl bullying), anti-oppression, social justice, self-defense and creative workshops including zine-making, silk-screening, button-making, art instruction, poster-/flyer-making, etc. Experience working with youth and/or adults in an educational setting is a plus! (any gender; no experience) Great news for folks with no music experience, there will be PLENTY of work for you if you want to help! Throughout the week you will be called upon to help with daily morning set up, camper check-in/out, hall monitoring, workshop room setup/breakdown, food set up and take down, serving lunch to volunteers, merch sales, volunteer break room maintenance, errand-running, general clean-up duties, and other tasks that help everyone have a great day at rock camp! (Female, male, trans, gender non-conforming; experience required) Available on-site or on-call throughout the day as a point person for medical emergencies, mental health issues, minor accidents, helping campers with special medical needs, prescriptions, and assisting the support and administrative team as needed. Combines well with other volunteer positions such as hospitality team, workshop leader, etc. We could use your help to keep Girls Rock! Rhode Island rocking year round (no musical experience necessary!)! We need regular support with everything from tabling at events to graphic design! If you’ve got a skill, we can probably use it! Here’s a list of areas you can help: PR/marketing, outreach, data entry, fund development, event tabling, music gear coordination, food donations, event coordination, graphic design, accounting, legal affairs, and more! If you are interested in helping out, please fill out our general volunteer application below! Only fill out this form if you CANNOT volunteer at our upcoming camp, but would like to volunteer year round!